Glass making is likely to have originated in Syria around 3000BC, but its use in windows appears to have been initiated by the Romans. For many centuries it was a precious and expensive material, used carefully and sparingly. Methods for making window glass have evolved over the centur­ies, either casting and polishing to make “plate” glass or blowing, as in the “crown” or “cylinder” processes. Early glass was full of impurities and imperfections and developments were aimed at reducing these imperfec­tions to produce clearer and less distorted glass in ever-increasing sizes. However, it is the very imperfections, such as surface irregularities (“ream”), curvature and tiny air bubbles embedded in the glass which give old glass its texture and sparkle and which combine to distort the reflections and image. Modern float glass is free from imperfections and relatively cheap, but does not have the same appearance as old glass. Between 1746 and 1845 excise duties on glass, which were based on a number of variables, particularly the thickness and size of the panes, affected the choice and use of glass. Islington houses up to about 1850 will probably have had crown glass in their windows. Later windows may have crown, cylinder or plate glass, each of which has its own characteristic appearance. Where old glass survives, every effort should be made to retain it, as it is an attractive and increasingly rare feature, often sacrificed unknowingly when windows are repaired or replaced. “Crown” glass was first produced in this country in 1678 and was probably so called from a small crown embossed on all glass produced at the Bear Garden, Bankside, glasshouse from 1684. It gradually displaced “broad” (also known as “muff’ or “cylinder”) glass and by the mid-l8th Century most window glass was crown. 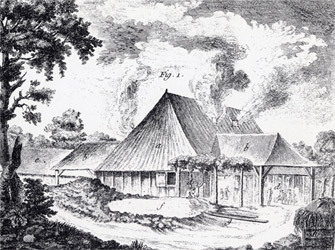 The initial reasons for the displacement were the superior brilliance and clarity of crown and the possibility of producing sheets of ever-increasing size, but the deciding factor was the imposition of excise duties on glass in 1746 which made the thinner sheets attractive economically. In its making, crown glass passed through the hands of ten distinct specialists. 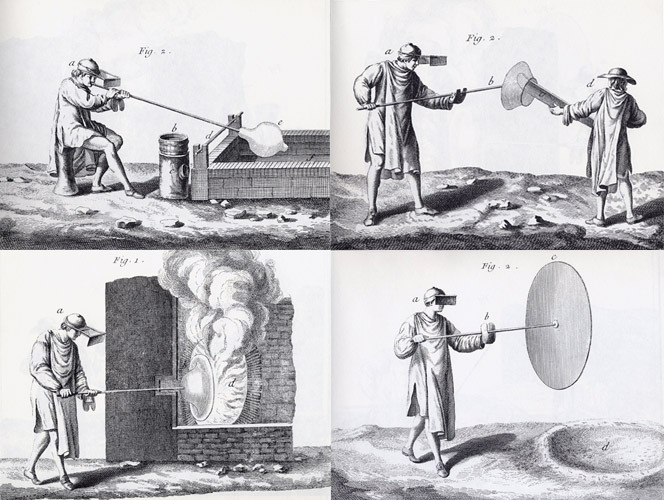 A globe of glass was blown and allowed to flare (open out) while being spun, producing a nearly flat circular plate called a “table”, about 1/16” in thickness (see illustrations). The diameter of the table was limited by the process, which severely restricted the sizes of the panes cut from it. Early tables were up to 48” in diameter, from which panes up to 24” x 20” could be cut; by 1820 a few skilled (and strong) blowers were able to produce tables up to 60” in diameter, from which panes 33” x 23” could be cut, but, although a 66” table was displayed at the Great Exhibition of 1851, 48”-54” remained the norm. Windows, whether casement or sash, were therefore designed with glazing bars, which divided the total area into small panes. Viewing in reflected light makes it clear that there are concentric low amplitude ripples across the table surface, but these distortions are sinuous rather than varicose in form. These arcs of optical distortion are characteristic of crown glass, stemming from the dynamics of the unfolding of the doughnut-shaped workpiece into a disc during forming. Even in smaller panes these distortions can be visible, particularly in reflection, if the observation conditions are just right. Where bubbles are present in the crown glass they can give valuable evidence of how the glass was made. Bubbles are elongated in a way which reflects the way the glass is stretched during forming, and in crown glass the principal stretch as the doughnut opens out to form a disc is circumferential. If sizeable bubbles are present, therefore, they will tend to be ellipsoids arranged in arcs with the major axes at right angles to the disc radius at that point. The brilliance of surface, the slight trace of impurities and the irregular surface texture of crown glass give it its characteristic reflective and refractive properties, adding life to the appearance of the windows. Cylinder glass is made by blowing a long cylinder of glass, cutting it along its length and opening it out flat. The process was re-introduced to this country in the l830s. In 1838 “Patent plate” glass, manufactured by polishing cylinder glass thin enough to avoid being classed as blown plate under the excise regulations, brought down the cost of less distorted glass. Glass taxes were finally removed in 1845 and, because thicker glass was no longer penalised, cylinder replaced crown glass in windows over the second half of the 19th Century. 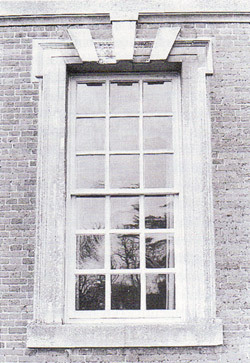 Improvements in the process also allowed larger sizes, hence the change in window design in the mid-late Victorian period, when the traditional pattern of Georgian and early Victorian glazing bars was abandoned. Mechanical processes for making cylinder glass were introduced into this country in 1910. Plate glass was produced by the lengthy process of polishing either cast or blown (cylinder) glass, generally at least 1/4” thick. Manufacture com­menced in this country about 1620, but only became fully established in 1673. It was initially extremely expensive and used only for mirrors or the most important windows in such places as Hampton Court Palace. Methods were continually improved and costs reduced and it became used for shopfronts and other large windows. Cast plate eventually displaced blown plate, which went out of production in 1845. With the lifting of duties and improvements in manufacture, plate glass became used increasingly in windows of private houses as the century progressed. Flat drawn sheet glass manufacture commenced in this country around 1918 and, although it was not without some distortion, it displaced most other glass in anything other than the largest windows. From 1959 float glass became available, which is optically near-perfect but, as a result, has none of the imperfections which give old band-blown glass its attraction. Toughened, wired and laminated glasses have been produced for many years; solar reflective glass is a more recent development. From the 1830s coloured glass was used in staircase windows and from the middle of the nineteenth century it became fashionable to use glass in front doors and door surrounds. The top two panels of a door were frequently glazed with acid-etched glass, sandblasted or frosted glass, or naturalistic or geometric patterns of stained or coloured glass. Sometimes these included small panes of glass painted with birds or flowers. By the 1870s the use of decorative glass in doors was commonplace, including internal doors to bathrooms, sculleries and outhouses. By the 1890s whole terraces were being built with front doors whose upper halves consisted almost entirely of elaborate patterns of coloured glass divided by narrow wooden mouldings. Coloured glass began to be used widely in windows as decorative ornament, notably in the Arts and Crafts revival of leaded lights. This continued also into the twentieth century and the Art Deco designs of the 1920s and 1930s. 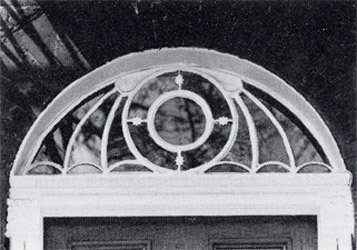 Many Georgian and later houses have glazed fanlights over the front doors, which were made using a variety of methods. Most have glazing bars made from a composite of lead and iron, but timber and cast iron were also used. The glass was generally crown. If a fanlight is to be repaired or replaced (where missing) it is important to match the original materials and glazing bar proportions exactly. This is a job requiring considerable expertise and should only be entrusted to a craftsman with the requisite knowledge1. The retention and repair of original windows is strongly recommended by the various conservation bodies, such as English Heritage and the Society for the Protection of Ancient Buildings (see also “Sash Windows” Leaflet). The importance of the original glass to the fabric of a house cannot be too highly stressed. The varied colours and reflections from the surface of old glass give a texture and depth to the appearance of an old window and the refraction of sunlight passing through the glass produces a distinctive pattern where it falls. Wherever found it should be retained as a historic feature. Before a sash is repaired the old glass should be removed and refitted after repairs; if, however, a sash is beyond repair and the decision is take to replace it, old glass should be removed and re-used in the new sash. There are various traditional techniques for loosening or removing the putty, but they are time-consuming and not always satisfactory. DO NOT ATTEMPT TO DO THIS WITH A CHISEL OR SCREWDRIVER! An infra-red lamp has been developed in Sweden and is available in this country2. This softens the putty without either scorching the timber or over-heating the glass. When the putty is softened the glass should be removed carefully, labeled and put safely aside for refitting when the window joinery has been repaired. BEWARE! Old glass is very thin and easily broken. If the putty on the outside of a window has cracked and is loose, the loose sections should be removed carefully, taking great care not to damage the glass. 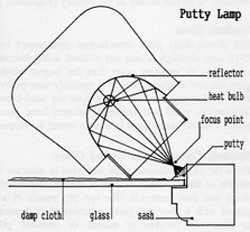 The missing putty can then be renewed using normal linseed oil putty, whose composition has not changed significantly over the centuries, applied with a putty knife. To replace a pane of glass in a timber sash, first cut out all the old glass and putty, taking care not to damage any other glass or the glazing rebate. Prime the glazing rebate with primer before reglazing and apply a layer of “back putty” to the back of the rebate. Push the glass gently into this so that the putty squeezes out at the edges, finishing about 1-2mm (1/16”) in thickness and hold the pane in place with glazing sprigs (tiny flat nails). TAKE CARE when fixing the sprigs not to damage the glass. Apply the face putty, smooth its face and trim the back putty. When painting windows always ensure that the paint slightly overlaps the putty onto the glass, both inside and outside, which will ensure that the putty will not dry out again and that rain and condensation will not reach the timber. Where reglazing a window which has modern sheet or float glass panes, or when glazing a replacement sash for which there is no original glass, consideration should be given to using new hand-made glass. Modern hand-made glass is available, at some expense, but it does not exactly match the surface texture and colouring of the original glass. Crown glass is being made again, after a gap of 40 years, but it is expensive and, as the techniques are having to be relearned, the quality and sizes available do not compare with that of older glass. Cylinder glass is not now made in this country, but German and French glass is imported3 and in most circumstances is an adequate substitute, if the original glass is not available. Stained or etched glass can be found to replace missing or broken sections and there are now several firms who specialise in reclaimed and reproduction glass4. The repair of leaded lights is a specialist job, but people skilled in glass repair are not hard to find. New etched, sandblasted or leaded lights can be made to order. This leaflet has been prepared in conjunction with the Planning Department of the London Borough of Islington. “Glass in Architecture and Decoration”. Raymond McGrath and A C Frost; Architectural Press, London, 1937. “Window-Glass Making in Britain c.l660-c.l860 and its Architectural Impact”. Hentie Louw; Construction History, Vol 7, 1991. “Fanlights”. Alexander Stuart Gray and John Sambrook; A & C Black (Publishers) Ltd.